Chicken wings are a restaurant favourite easily made at home. Try out our savoury-sweet sauce on these baked chicken wings. BAKE 12 wings (separated at joints, discarding wing tips) at 400°F (200°C) in the oven for 20 minutes; drain. COMBINE 2/3 cup (150mL) KRAFT Honey Mustard Barbecue Sauce and 1/2 tsp (2 mL) black pepper in a medium bowl. 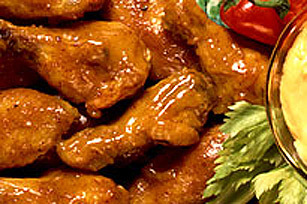 MARINATE wings in sauce for 20 minutes. BAKE 20 minutes more, brushing with additional sauce. For the barbecue, microwave wings covered on HIGH for 5-7 minutes. Drain. Marinate wings in sauce for 20 minutes. Finish cooking on barbecue on MEDIUM, brushing with additional sauce.